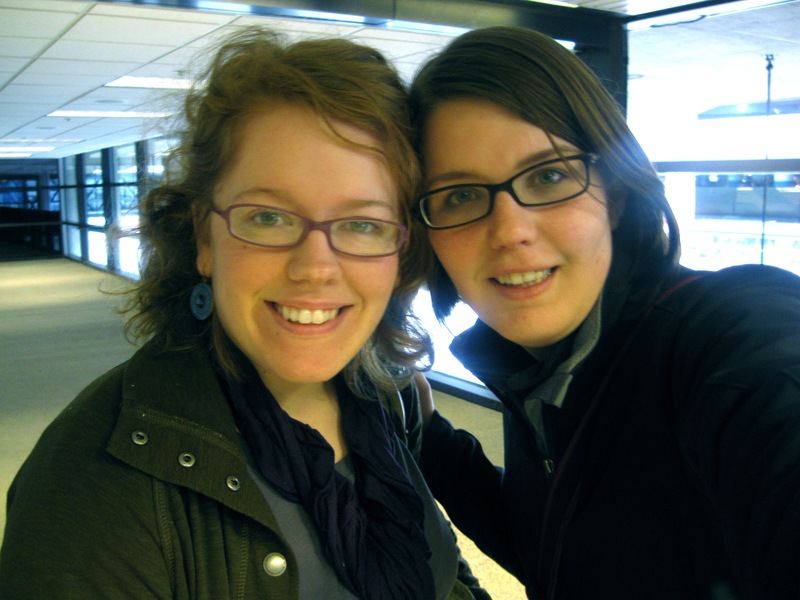 I just dropped Tessa off at the airport, but we were already discussing when we can manage to get together again! It was so much freaking fun to have her here for a few days, especially because I used her visit as an excuse to play tourist in my new city. Tuesday night, after her arrival, I dragged her to get pho. What can I say? I have an addiction. She enjoyed it. Well, she said she did. She really had no choice. I think I spent 4 days talking it up to her and going on and on about how amazing it was. I’m known for doing that kind of crap. Actually Tessa and her husband came to visit us in Fort Wayne once and I spent the entire month before they arrived telling them about my obsession with Cindy’s diner in downtown Fort Wayne and more specifically, how they had The.Best.Buttered.Toast.EVER. When Tessa and Greg arrived, I woke them up at 6am and forced them to go eat greasy, trans-fat filled, margarine-covered toast. Yeah, that actually happened. Being friends with me IRL is totes awesome. Moving on to Wednesday, we were busy! We started off with breakfast happy hour at Toulouse Petit, where I had a delicious Croque Madame. After a bit of putzing around I talked Tessa into going to yoga with me (fun fact: my first studio yoga experience was an intro course with T like 7 years ago). The rain and wind were kind of crazy at this point so we debated back and forth about going to Pike Place Market. The sun came out and we convinced ourselves we had to get out. We braved the winds to explore the market, where I subsequently lost my mind over a stand selling dried fruit with no added sugar. Seriously guys. No.Added.Sugar. I repeated that like 28 times and then bought 2 bags. I regretted not buying 4. We stopped for lunch at Beecher’s and dove into some flagship grilled cheese while sitting on rather uncomfortable milk bottle stools. 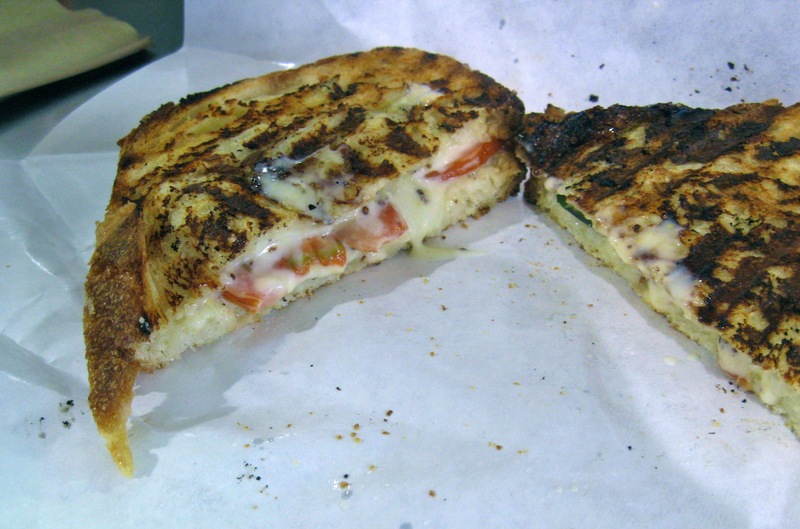 Hmm… This sandwich is melty cheese, pesto, and tomatoes between crispy bread. There was nothing inherently wrong with it, but it just didn’t totally float by boat, you know? I probably wouldn’t go back for a sandwich, but Beecher’s cheese curds and flagship cheese are both A-OK in my book. We had both already eaten lunch obviously, but we were lured into Piroshky Piroshky. Anthony Bourdain is a fan, and the smells were intoxicating. Unfortunately our microwaved cinnamon raisin cardamom braid was not all that. It was bland, with no cardamom flavor to speak of, and it had a weird texture. I’m not saying don’t go to Piroshky Piroshky, but I am saying maybe try to go savory rather than sweet. I’d go back to try a potato, onion and cheese piroshky. Oh, before we move on, please look at the awesome thing T and I found at some random toy store in the market. 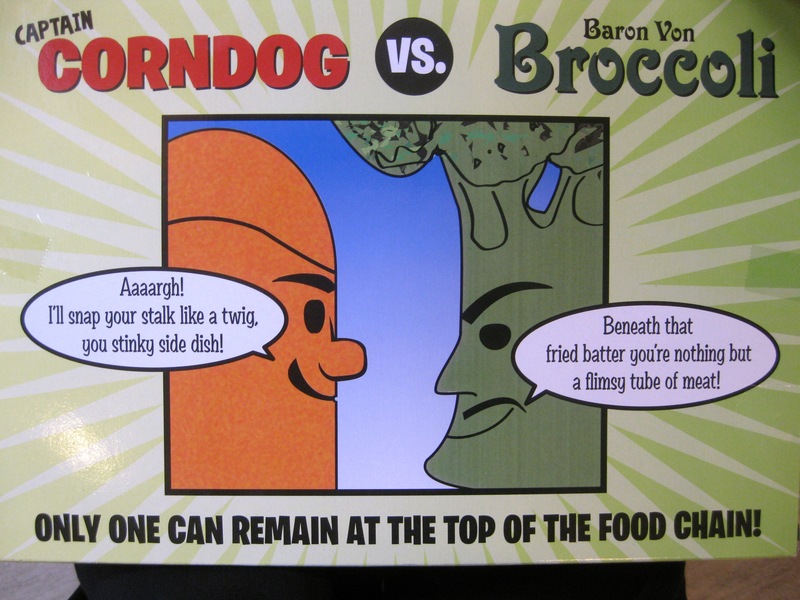 They were corn dog and broccoli action figures who are also apparently archenemies. Umm, yeah. We nearly died laughing while repeating “flimsy tube of meat” and “stinky side dish.” For some reason when we tried explaining it to Brent that night at dinner, he did not find it as hilarious as we did. Thursday, Tessa proved her rockstar status as best friend by going shopping with me. No easy task. I am a total freak when it comes to shopping. Honestly. I wander aimlessly into stores, get overwhelmed, and usually leave in near tears. As a result of my inability to shop and the cross-country move, my wardrobe has consisted of a pair of yoga pants, a pair of ill-fitting skinny jeans, 3 t-shirts, a tank top, and a fleece jacket. If that didn’t require an intervention I don’t know what does. T was a trooper and we made a lot of progress at the clearance racks at Macy’s and Nordstrom Rack. Thank God she was here to help! Our touristy dinner of choice for Thursday was dinner at The Crab Pot. 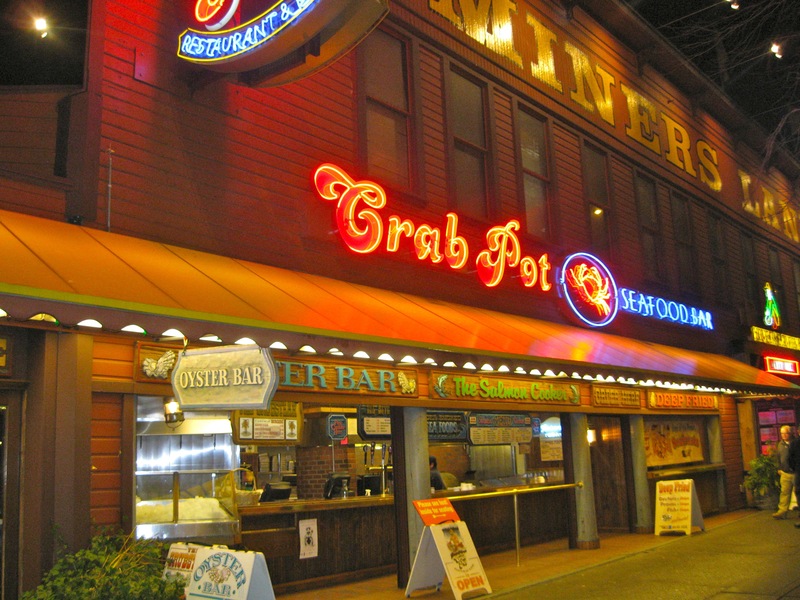 Featured on Man vs. Food, The Crab Pot is a ridiculously popular restaurant on the Seattle Waterfront. I was not joking when I called The Crab Pot popular. They do not take reservations and there was a 30-45minute wait when we arrived. On a Thursday. 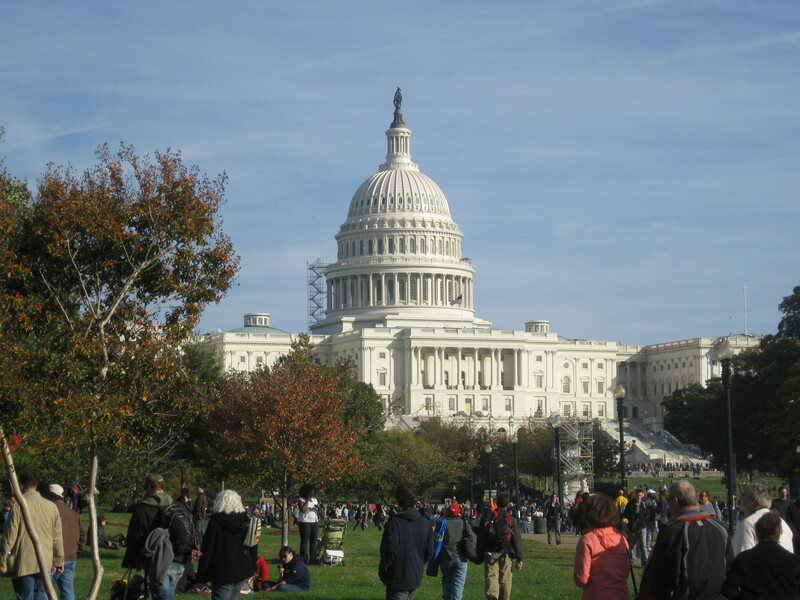 In March. Ugh. I was starving and really did not anticipate much of a wait. We distracted ourselves in the bar, where I consumed a ridiculous drink. 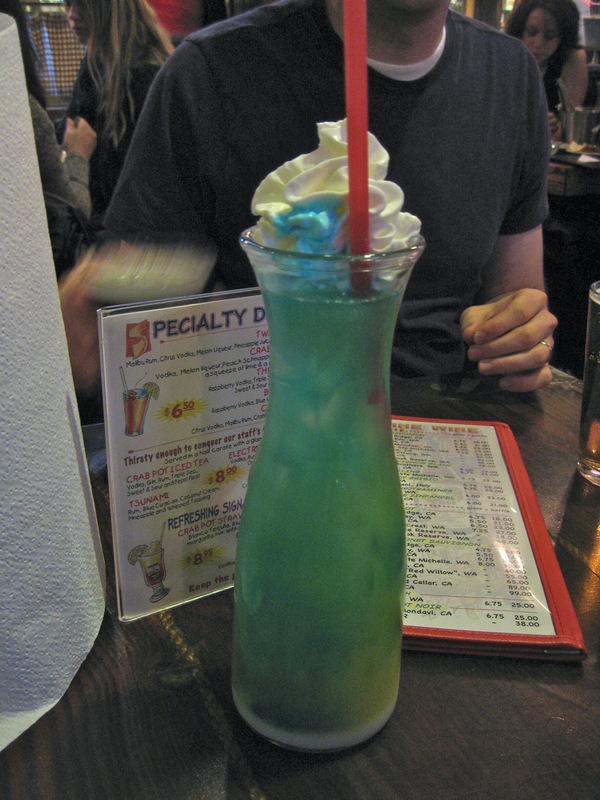 That was called the Tsunami and it was blue and delicious. And served in a giant glass carafe. Hey, no judging. We were celebrating. Thursday was our five-year wedding anniversary. Brent, party of 3! Dinner time! 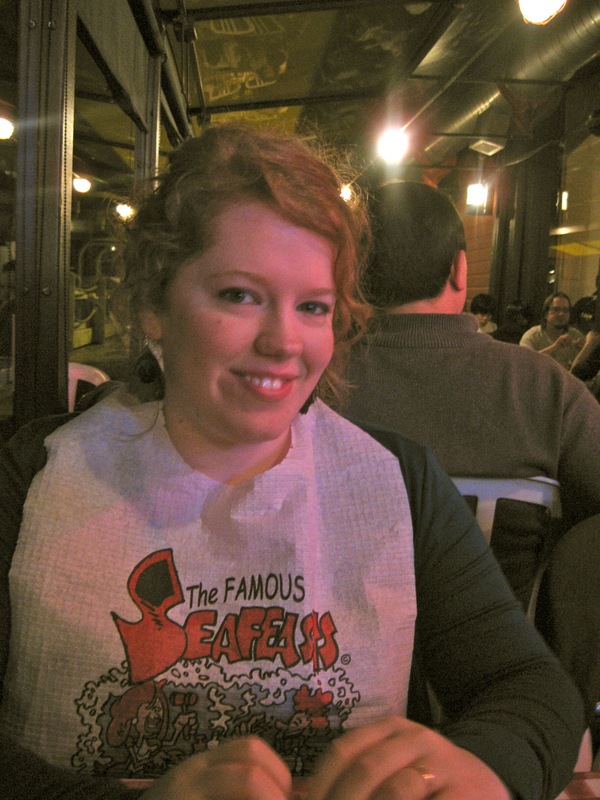 The Crab Pot is known for their “Seafeasts” which are buckets of seafood dumped on butcher paper on your table. Sounds classy, no? 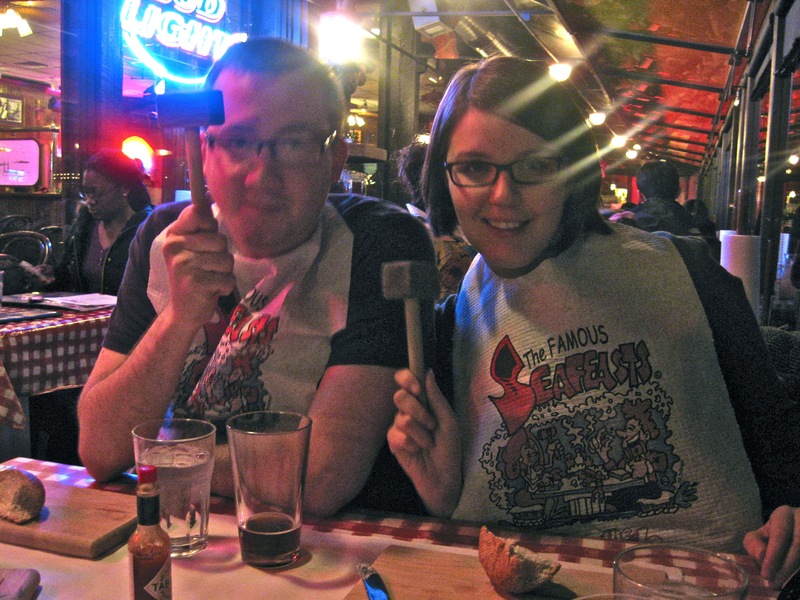 To complete the theme, they also give you bibs and wooden blocks and mallets, with which you are expected to beat your dinner into submission before consuming it. Our bibs were donned. Our mallets were ready. 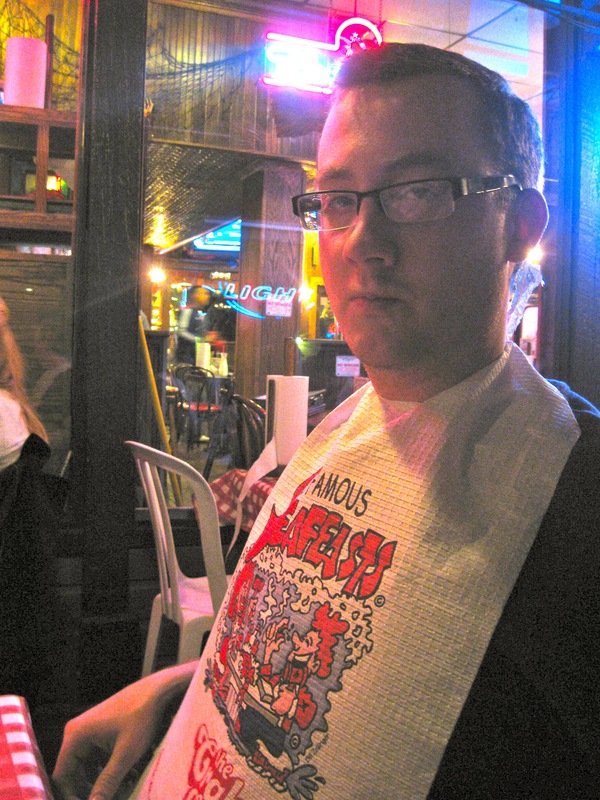 Brent was looking pretty serious as we waited for the arrival of our bucket o’seafood. And it has arrived. 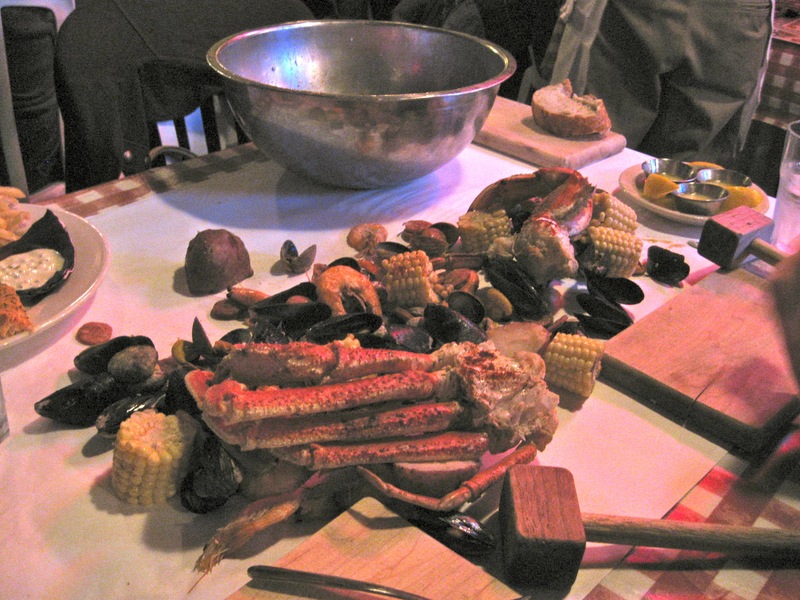 We ordered the Westport Seafeast, which contained Dungeness crab, Snow crab, Mussels, Clams, Shrimps in their shells, Andouille sausage, Corn on the cob, and red potatoes. Let the madness begin. In attacking our dinner, I went straight for the dungeness crab. It’s what I came for and it did not disappoint. I wasn’t actually all that interested in any of the other elements, but I did have a bit of the snow crab, mussels, and clams as well. I would definitely go back to The Crab Pot, but I would probably just get the whole Dungeness crab. It’s a fun place to take out of town guests! And this morning I rode the lightrail with Tessa to the airport, snapped one last picture and said good-bye. I can’t be too sad though. We leave for our anniversary trip to San Francisco bright and early tomorrow morning at 6am!! Posted in Uncategorized and tagged Brent, Friends, Restaurants, Seattle. Bookmark the permalink. 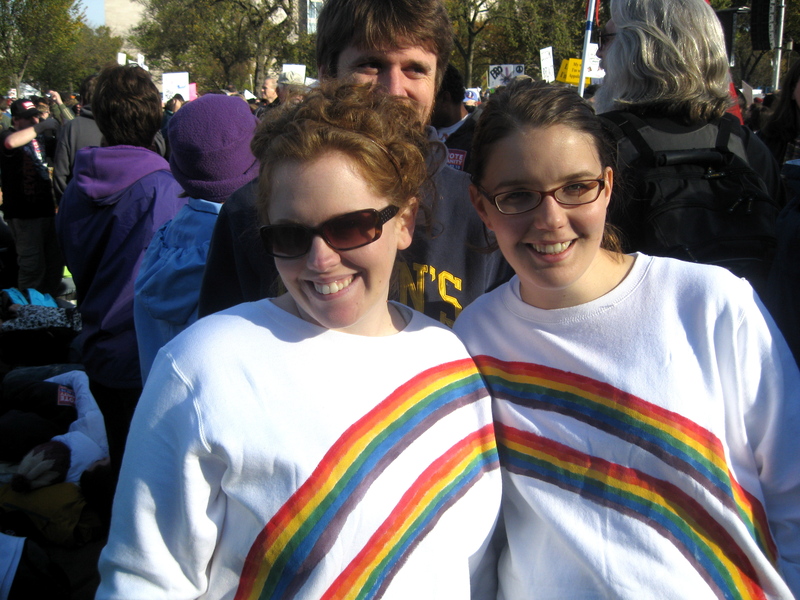 and dressed as a double rainbow with my best friend. That wasn’t enough traveling for me, so I also headed to Chicago to pick up my mom so that we could roadtrip to Wisconsin to see family. 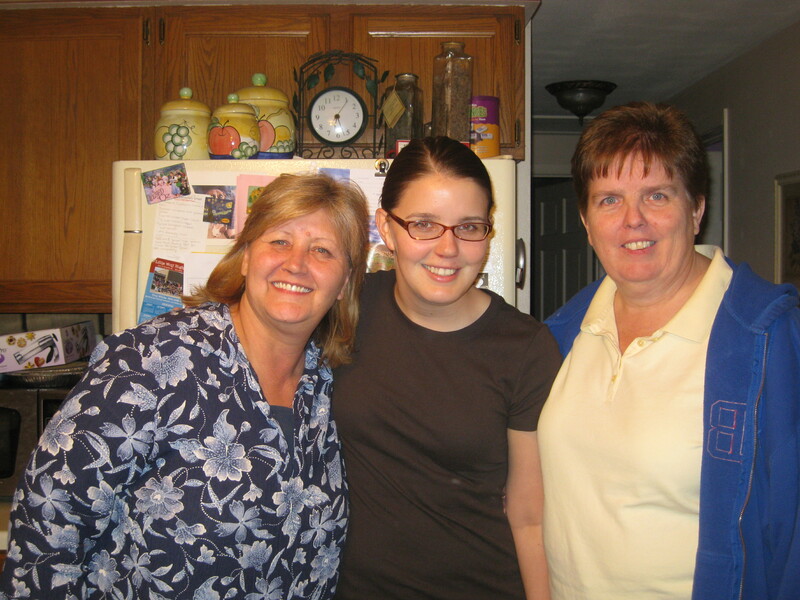 I hadn’t seen my aunt Sherry and cousins in 5 years!! It was such a great visit, and definitely worth the 16 total hours of driving. 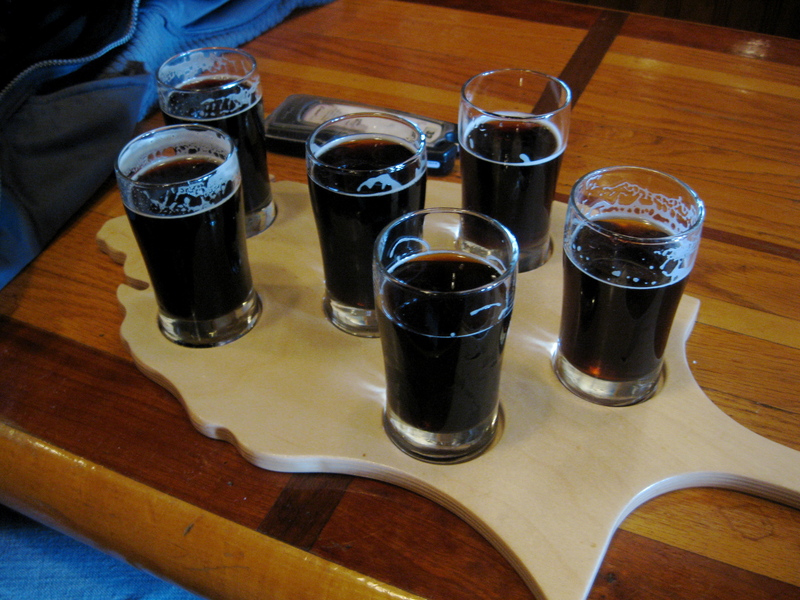 This past Sunday, Brent and I headed to Kalamazoo, MI on another mini roadtrip for All Stouts’ Day at Bell’s Brewery. I love stouts! The Double Cream Stout was definitely my favorite. I’m finally back home now, and easing myself back into my routine of blog-reading, cooking and , oh yeah, studying – 4.5 more weeks! Brent is on me again to cut down our eating out budget, an idea that my waistline can certainly agree with, so I’ve made the effort to cook at home this week. Tonight’s meal was the first “new to me” thing I’ve made this week. 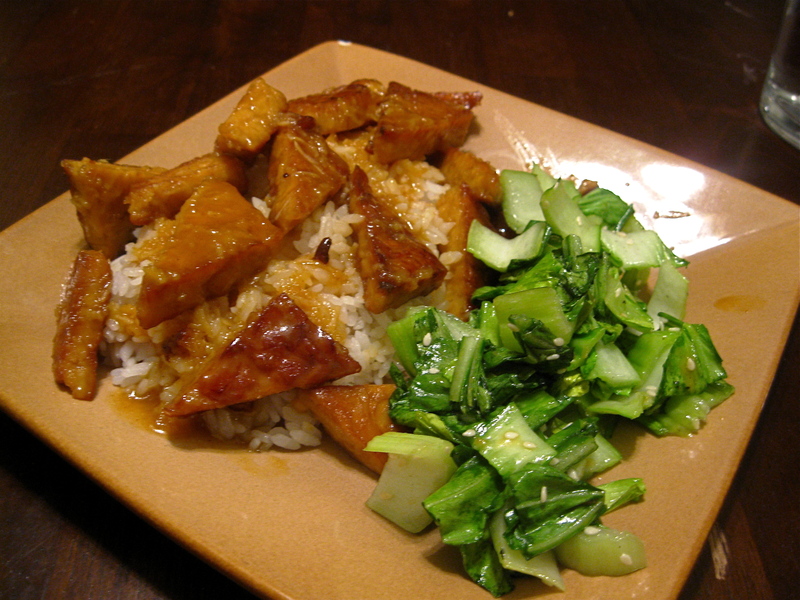 I tried the Orange Pan-glazed Tempeh from 101 Cookbooks, which I saw on (never home)maker last week. I forgot the lime and cilantro because Brent and I were too hungry by then, but both would have been very good I’m sure. My only note on this recipe was that it took me 20-30 minutes for the sauce to reduce down to a “thick glaze,” but it worked well nonetheless. Tempeh is one of those foods I don’t eat or make frequently and I’m still on the fence about whether or not I like it. I found it super filling though! I ate 3/4 of mine and Brent finished the rest. Posted in Uncategorized and tagged beer, Family, Friends, tempeh, vegan. Bookmark the permalink. This weekend my friends Tessa, Greg, Kathryn, and Jesse came to visit us in the Fort! 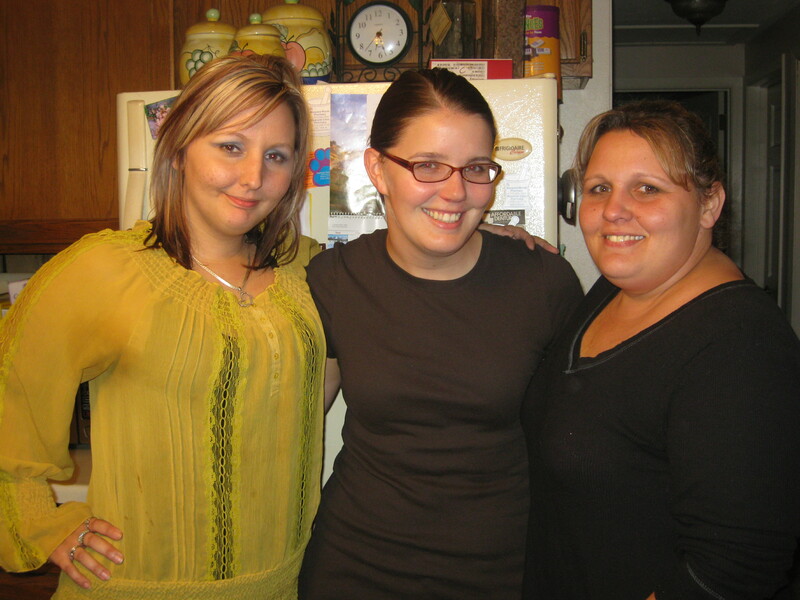 I love getting together with my friends, and I was so excited this time because we planned on going dancing! I am quite possibly the world’s worst dancer (Brent tells me I should hate dancing because I’m so bad at it), but I enjoy it so much! Before the boozin and groovin, I fed the troops. I made a batch of Teany’s Top-Secret Chili from this book. 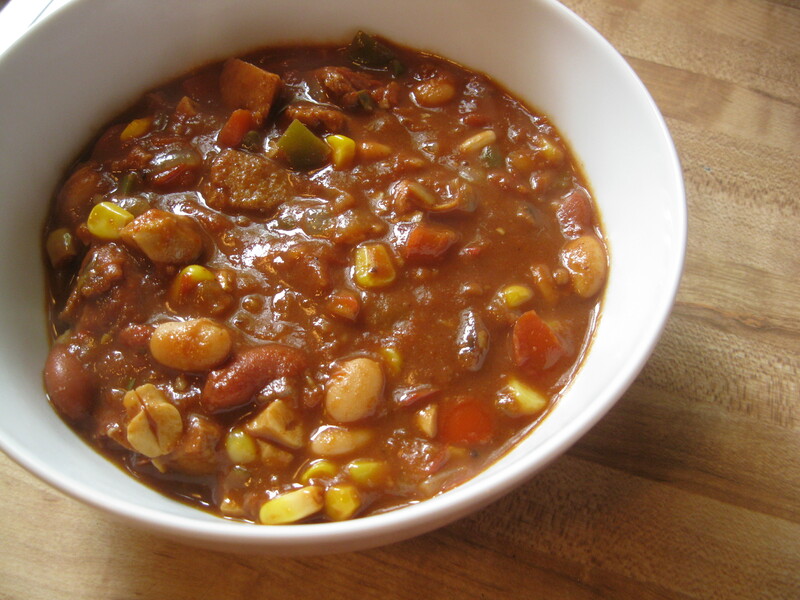 This is probably my favorite chili recipe. I love the seitan in it. Everyone enjoyed dinner, as I knew they would (Tessa’s the one who gave me the recipe. She loves it). I also had a pitcher of pre-made POM margaritas, which were also a big hit. No meal, especially one for my friends, is complete without dessert! 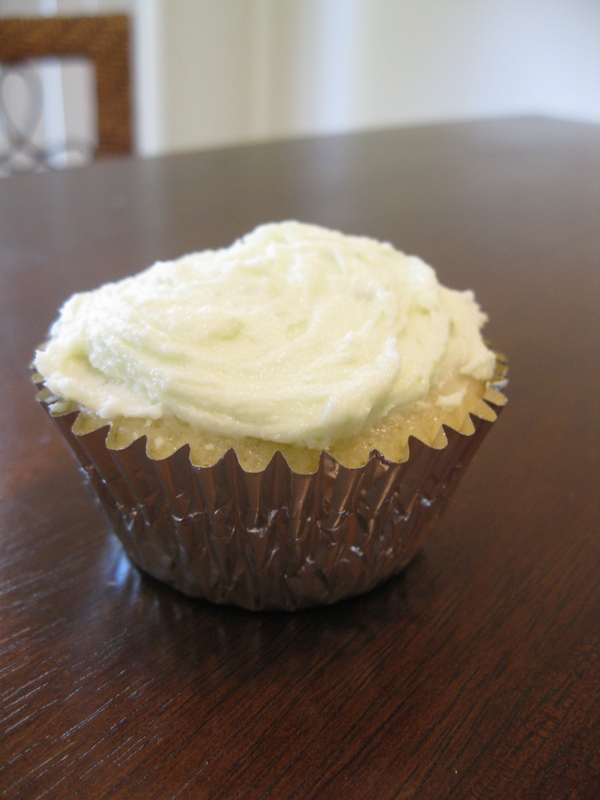 I made a batch of Mucho Margarita Cupcakes from Vegan Cupcakes Take Over the World. I once again used my tequila-lime buttercream frosting. 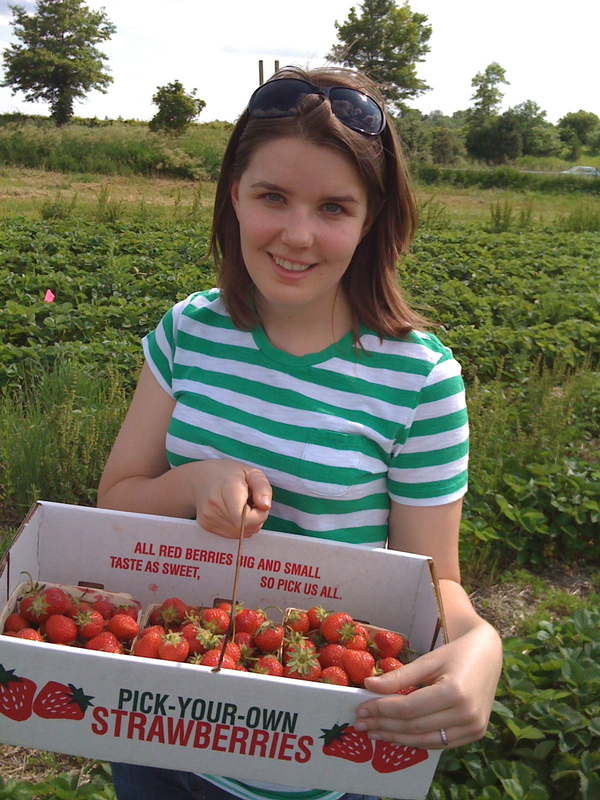 So deliciously sweet and tart! After some dinner, dessert and a few drinks, we were off the the bar. I made a fool of myself, had way too much fun, and stayed out way too late! Luckily, once we were at the bar, I managed to have equal amount of water and booze so I woke up feeling as close to normal as I could hope for. I’m glad I got in a fun weekend with friends because I start back at school on Wednesday, so the rest of my summer may be a whole lot less fun. 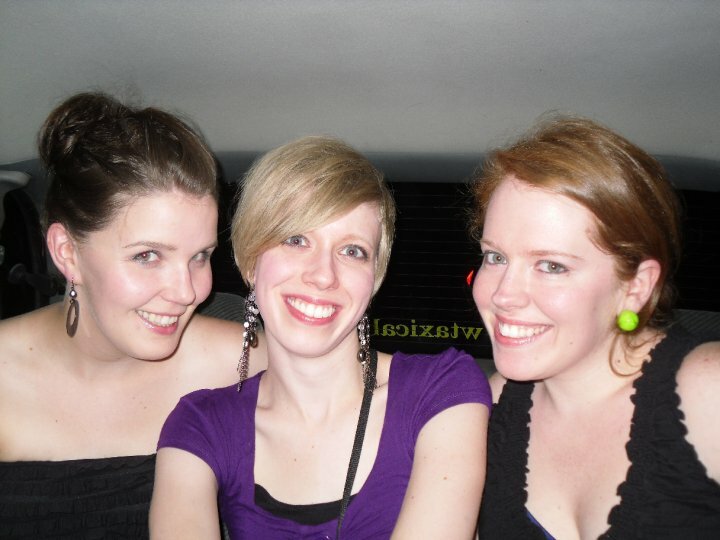 I’ll leave you with a photo of Kat, Tess, and I from the cab ride (love college roomies!). Posted in Uncategorized and tagged cocktails, Cupcakes, Friends, soup. Bookmark the permalink. I’ve been cooking, but not posting about it. Here are some reviews of recent meals. 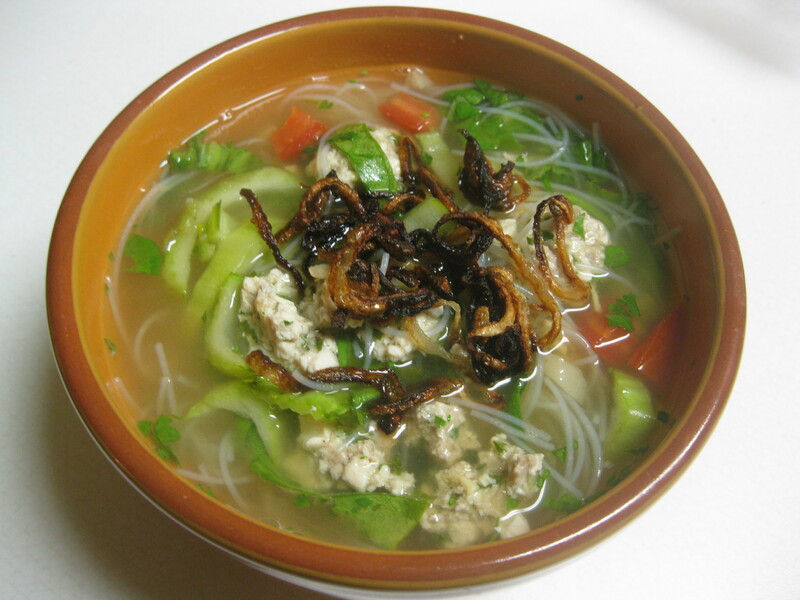 Last week I made Bok Choy and Rice Noodle Soup with Turkey Meatballs. Sounds good right? And the picture in the cookbook was pretty convincing too. The ingredients smelled wonderful and I was convinced it would be one of the best meals I’ve made at home. Ehhh, not so much. It didn’t taste bad. It just didn’t really taste like anything. I liked the idea of making the turkey meatballs with some tofu as well, but those just feel completely apart. They definitely needed some type of binder. It was definitely a disappointment. I can’t really recommend it. They can’t all be the best meal ever, I guess. Earlier this week I made a Tuna Casserole from Rachael Ray. 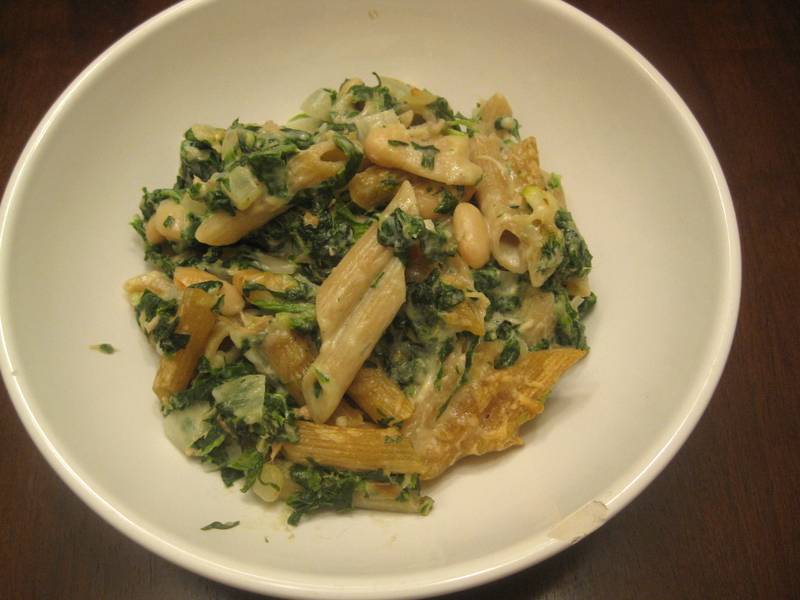 I rarely make tuna casserole and this one sounded like it could be a winner – lots of spinach and no cream of whatever soup. The only change I made to the recipe was to use vegetable broth in place of the chicken broth. The recipe made a ton, but I decided I might as well make the whole thing and hope the leftovers would be good. It came out pretty well. 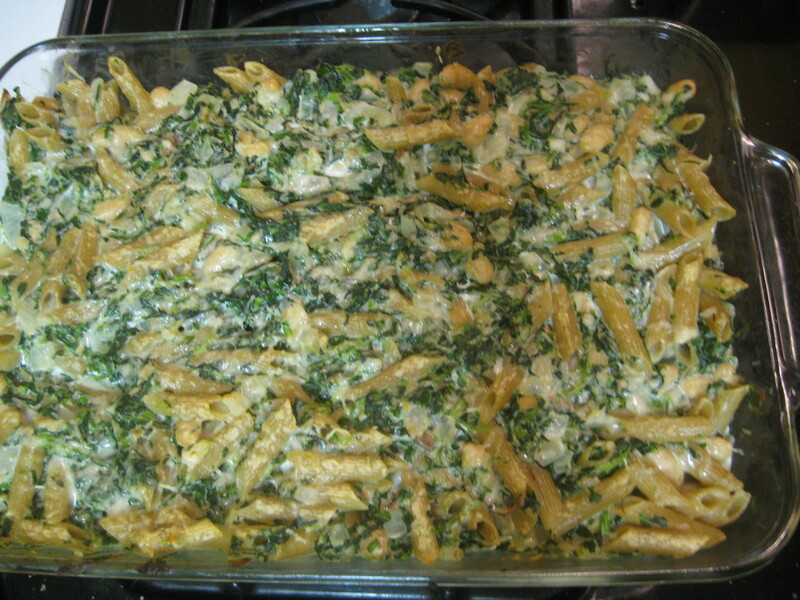 While I was making it, I told Brent it looked more like spinach casserole. I loved the combo of the tuna, creamy cannellini beans and tuna. And anytime I can throw this much veg into a single dish, I’m pretty happy. Brent commented that he could do without the beans, but I really liked them. We’ve eaten the leftovers, which were pretty good as well. I think I would definitely make this recipe again. 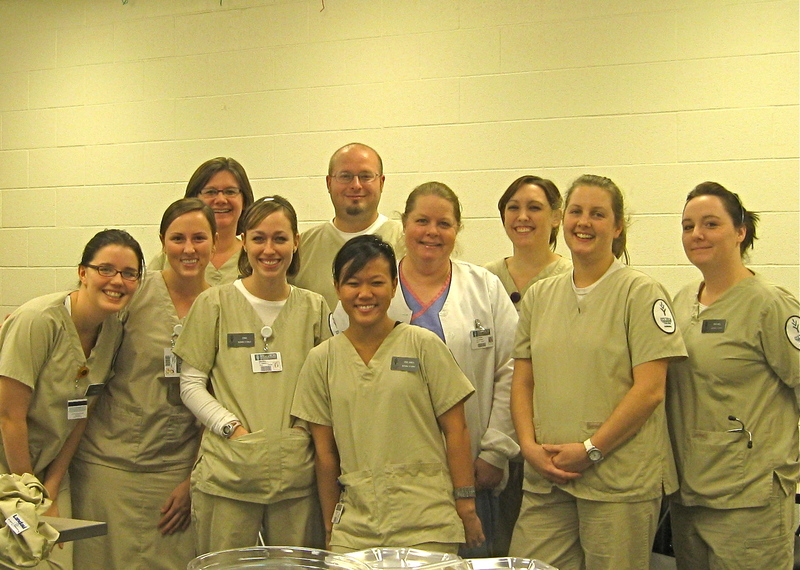 Today was my last day of clinical for the semester, so afterwards my clinical group had a potluck (so much food!!) and finally got a group photo after putting in a full day. Only two more days of school! I’m already making lists of things to clean and things to cook over break! Can’t wait! Posted in Uncategorized and tagged casserole, Friends, soup, tuna. Bookmark the permalink. I can’t believe it’s already November! I’ve already decided that 2009 is going down as the fastest moving year of my life. We have less than two months left of the year — and only 3 weeks until I host Thanksgiving. Yikes. I’ve made a few things I wanted to share with you all, including Pan Bagnat and Pumpkin Spice Cupcakes with Cinnamon Cream Cheese Frosting, but ummm… I just never bothered taking pictures of them before devouring them. Oops. Both were delicious and I have witnesses who will agree with me on that. Both were served to my friends when they came to visit this weekend. I don’t have a lot of pictures from the weekend, but here’s a funny one of Greg and Larry. Sometime last week I wasn’t feeling that well and in an effort to avoid dragging myself to the grocery store I made this peanut butter noodle dish. Soba noodles, broccoli, shredded carrots and this peanut sauce, minus the cilantro. I thought it was really delicious and so ridiculously simple. I’m definitely going to try to remember this for the next time I want a quick pantry meal. Tonight, after a weekend involving candy, cupcakes and alcohol, I just wanted something simple and healthy for dinner. I baked some of my frozen Jamaican Veggie Patties and sauteed some broccoli with garlic. I was hoping for the best with the veggie patties. They had been frozen for nearly 6 months, but I wrapped them really well and they showed no signs of freezer burn. I put them straight into the oven frozen and baked for 50 minutes. I was pleasantly surprised at how well they came out. Still flaky and delicious. 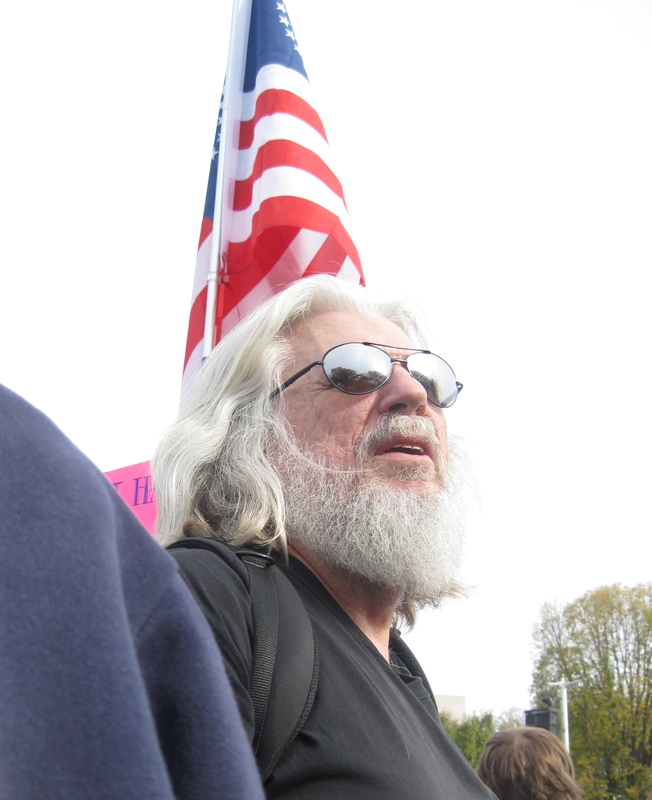 Posted in Uncategorized and tagged Friends, Larry, vegan. Bookmark the permalink. Like I said earlier, we had a blast this weekend! Ross, Tessa, Kathryn and I have been friends since freshman year of college and spent the 2-3 years after that as roommates. For nearly 7 years they’ve been my second family. I couldn’t ask for a better group of friends. This weekend was an awesome celebration of Kathryn and Jesse’s wedding and it was the first time all of us have been back at the University of Illinois in nearly 2 years. 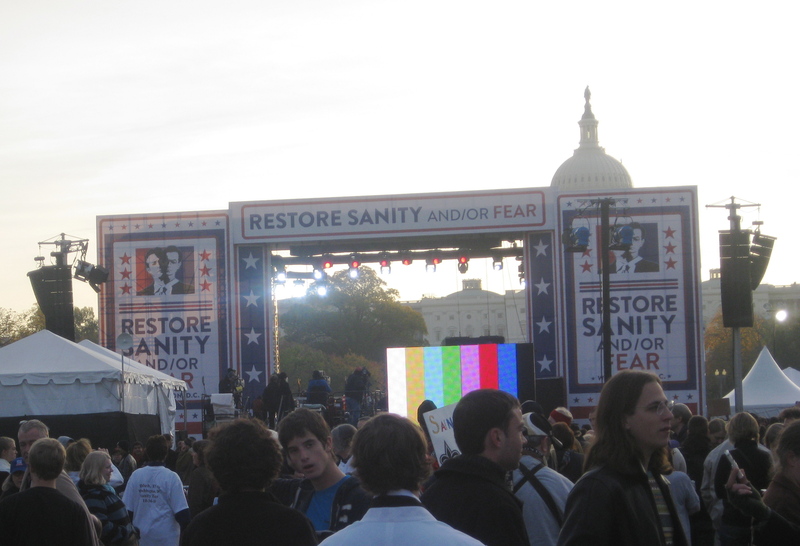 The ceremony was on the main quad of the campus, with the reception at the union. The after party continued at Murphy’s, which was one of our old haunts. (Fun Fact: I worked as a bartender there during school). "Backstage" -- Kathryn getting ready! Posted in Uncategorized and tagged Friends. Bookmark the permalink. As I said before, we went home to Chicago this weekend. Friday night, we stopped at Tess and Greg’s place as we usually do when we come into town. Tessa had been wanting to take me to this “conveyor belt sushi place,” which sounded both odd and amazing. Sushi Station was heaven on Earth for me. I loved everything about it, especially the Paradise Roll, which consists of avocado, tempura shrimp and toasted coconut. There was no waiting for food and I could spontaneously choose whatever I wanted, and I got to try so many different rolls rather than just one or two. I actually made Brent go back here for lunch on Saturday. I am that obsessed. After dinner, we had a very entertaining Friday night, involving a bit of booze, The Game of Life, and some Nintendo Wii. We tried a variety of new drinks, including electric lemonade, the best of the three we tried. We also tried a salty chihuahua. Blech. I like tequila, but I disliked everything about this drink for some reason. However, our drink choice only got nastier when we tried the last drink. I seem to have blocked out the name. I wish I could forget the taste. I don’t know what it was but it involved banana liqueur. Never Again. Friday night also marked our first introduction to Byrnie, Tessa and Greg’s 9 week old schnauzer puppy. This dude is crazy. He does not sit still for anything. Makes me appreciate my big, lazy dogs. 🙂 He is sure is adorable though! I just think this photo is hilarious. He looks like a stuffed animal! Also noteworthy was the fact that Tessa made cupcakes!! These were Vitamin C Cupcakes from Cupcakes Galore, and I loved their zestiness. I ate one four! Tess sent me home with some and I even had one for breakfast Monday morning. There was some other stuff thrown in there, like a backyard wedding and a super cute pedicure, but those are the highlights. Tomorrow is already Wednesday! Sweet! Posted in Uncategorized and tagged Friends, Restaurants. Bookmark the permalink.